This DVD came free with any E-rated Sega game purchased at GameStop. 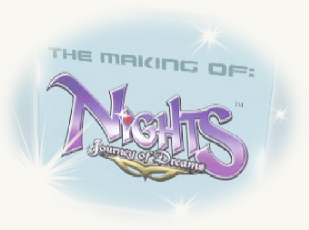 It is a short documentary promo running through a brief history of NiGHTS into Dreams and then showcasing the latest game, NiGHTS Journey of Dreams. It is certainly a very interesting video with some cool shots of SonicTeam doing their concept work. Thanks to Xenon for sending this in. This entry was posted on Monday, September 28th, 2009 at 10:10 am	and is filed under Video. You can follow any responses to this entry through the RSS 2.0 feed. You can skip to the end and leave a response. Pinging is currently not allowed. Very good. Never got this DVD media to store the collection, not found for download. I wanted this one to me. Yeah i don’t own it either, it was a USA only thing. You can find them on Ebay quite a lot though I need to buy one! Did the folks who put this together think Reala is Wizeman? Everytime they mention Wizeman they make a point of showing Reala. Woow this sounds awesome!! 11 years after Into dreams?!!? wow!